For a long time I used baby wipes to take off my makeup, fragrance free, normally with aloe in the ingredients until my skin decided to rebel and when I discovered LUSH Babyface that become my next thing to take off my face but sometimes even when I'm at my most tired and I cannot be bothered to crawl to the bathroom I need a face wipe. Finding one that doesn't feel drying can be trial and error .. earlier this year I was sent the new Kleenex range that consisted of eye wipes and facial wipes - both of which after a while I found rough and drying. Being sent the BeautyWorksWest Cleanse which are organic cloths [ being the organic nut I am] these contain Aloe Vera and Pomegranate to help against ageing, smooth and calm the skin. The claim is that they are to leave the skin feeling refreshed and revitalised without any residue. Really want to know the wipes I cannot live without...No7 Beautiful Skin Quick Thinking Wipes - the ultimate wipes in my life. Now these are the wipes that go well with my skin - they are for all skin types and as much as my skin causes havoc and changes it's ideal but also if I take my makeup off and say don't wash my face - when it's drying it doesn't feel taut or dry it actually feels moisturised. 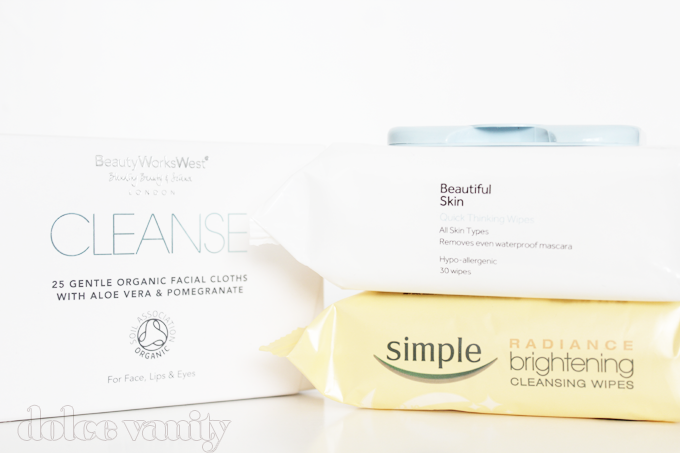 1.BeautyWorksWest Cleanse* · 2.No7 Beautiful Skin Quick Thinking Wipes · 3.Simple Radiance Cleansing Wipes*. do you have favourite makeup wipes? Its really nice to see someone blog about face wipes as i'm sure we all use them. I actually really love tesco everyday value face wipes (covers face). They contain aloe and camomile and leave my skin feeling really plump and soft. Haha, my mind did go there! I only use make up wipes when I'm feeling really lazy and can't be bothered to remove my make up. I use Soap & Glory's wipes and I love them, they don't irritate my skin or make my eye sting. My favorite wipes are Soap and Glory off your face. The get all my make up off and smell delicious!